Place the lemon zest and juice, oil, honey, salt and pepper in a bowl and whisk to combine. Divide the mixture in half. Add the garlic to one half and the chopped parsley and dill to the other half. Thread the chicken onto metal skewers, brush with the garlic and lemon mixture and sprinkle with salt and pepper. Heat a large non-stick frying pan or barbecue over medium heat. Cook the skewers, in batches, for 3–4 minutes each side or until cooked through, brushing occasionally with the garlic and lemon mixture. Place the fennel, rocket, mint, basil and extra parsley in a bowl and mix to combine. 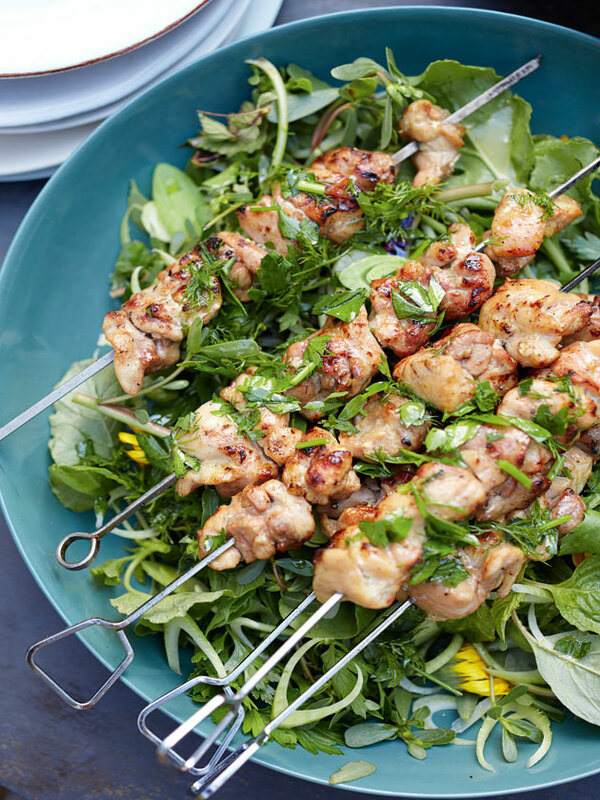 Divide the salad between 4 serving plates and top with the skewers. Spoon over the herb and lemon mixture and serve with the lemon wedges. Serves 4.